I'm always a little wary when requesting romance novels from author's I don't know, but I was pleasantly surprised with this one! Olivia is an up-and-coming sports reporter who is hardworking and driven. Her career is something she values and it's her main focus...until she meets Nate...kind of. Nate has just been drafted to a professional football team and it's Olivia's job to show the world who he really is in a documentary for the sports channel she works for. Olivia is a no-nonsense kind of women and Nate is, well, he's a college kid. When they meet there is immediate attraction, but it isn't insta-love, more like insta-lust. The two of them are definitely drawn to each other but they also do a nice job of not giving into it. Well, they don't give into it immediately. I liked Nate as a character a lot. He's young but ambitious when it comes to his career. He knows what he wants and he works hard to get it. A lot of people think that he made a mistake early on in his college career but as the real story unfolds you learn a lot about Nate as a person, and he's a good one. It's also obvious that he really cares about Olivia (despite some not-so-nice things he says) and wants to be with her no matter what. As far as Olivia goes, she's definitely interesting. I love how hardworking she's written to be, but I also think that hinders her a little bit. She's obsessed with the age gap between her and Nate, but it's only five years and not that bad. As the story progresses her change is obvious, right up to the last sweet little page. 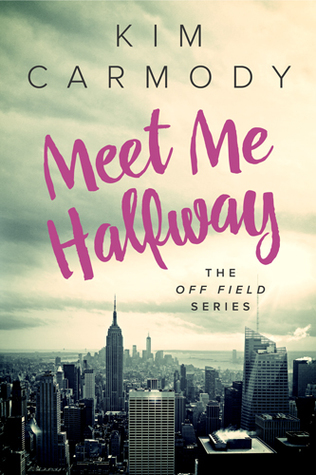 I love character growth and sometimes we don't see that in romance novels, but Carmody does a great job expanding these characters. There was, of course, some drama, but I think it fit the story well. There was no absolute silliness and everything was handled in adult ways. The physical relationship between the two characters helped the story, but didn't define it. There were well-written emotions involved and plenty of excellent dialogue. All in all a good, quick read. I'm glad I requested it! Thanks to NetGalley and Kim Carmody Books for the ARC.